Yesterday we put up our Christmas tree. For many years, we had a proper natural tree, and I loved the excitement of getting the tree, but it is a relief now, in retirement, to have an easy little synthetic tree that just comes down from the attic. And anyhow, it is the decorations that give me most pleasure. Out come the boxes of old and new. 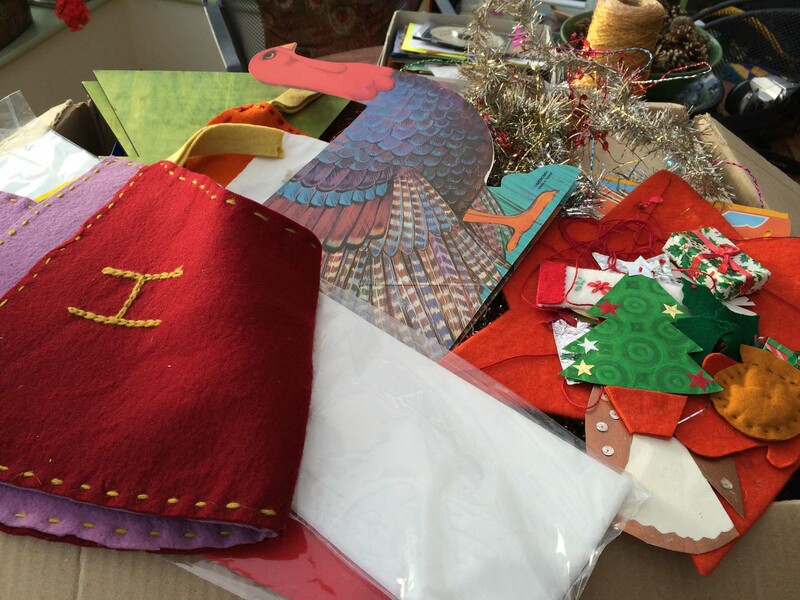 There are the felt stockings my mother made us when we were children, the American Thanksgiving paper turkey, sparkly decorations, the Christmas mobile, and much, much more. 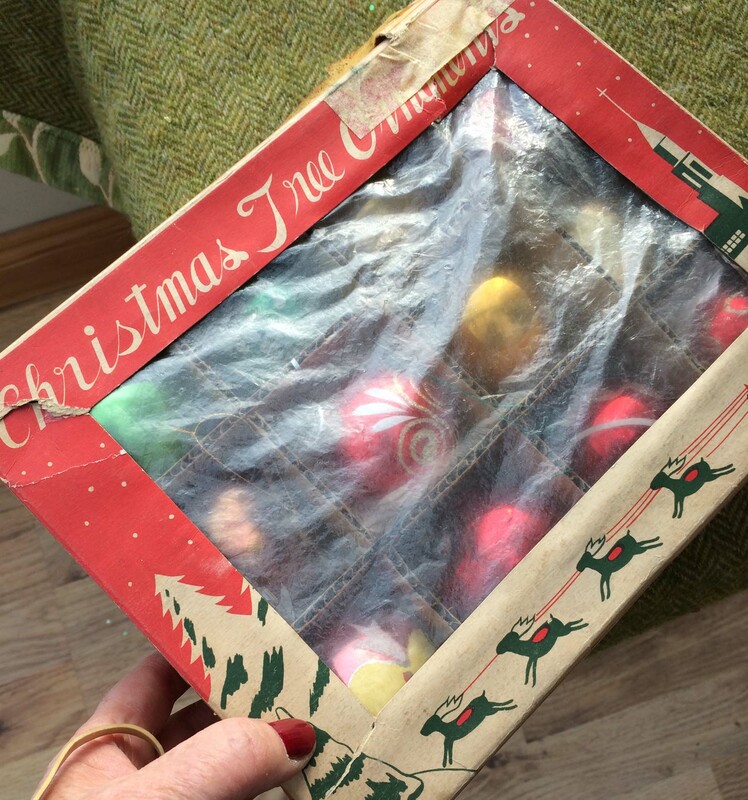 These are old glass balls that came from my grandmother. These are so fragile that they could be cracked with just a squeeze of the hand. The box (much repaired) alone is a delight. Odd little things have come into the Christmas collection – and stayed. 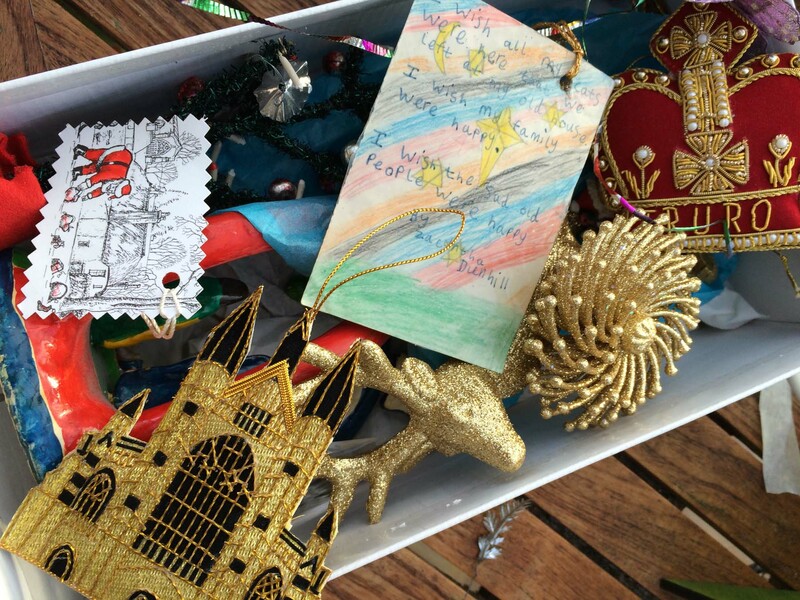 I love Zacyntha’s little card of wishes (including the wish that all her cats were with her from the old house …) Not sure why we have mementos of Truro and Winchester Cathedral … The golden Catherine Wheel (from New York) was a gift to me, of course! 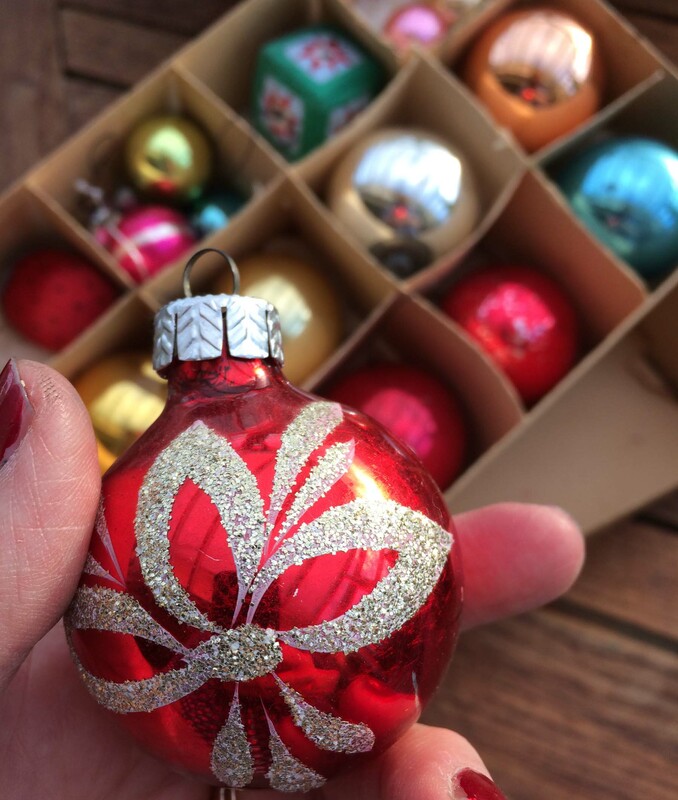 Some ornaments truly are treasures. 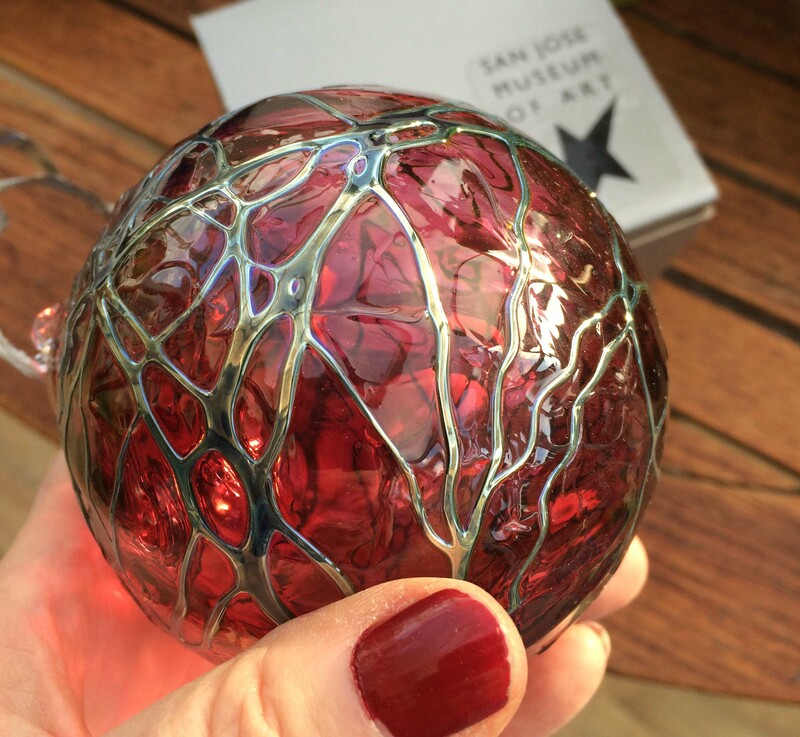 My American sister-in-law gave me this beautiful glass ball from San Jose’s Museum of Art. Alas, there are always breakages. 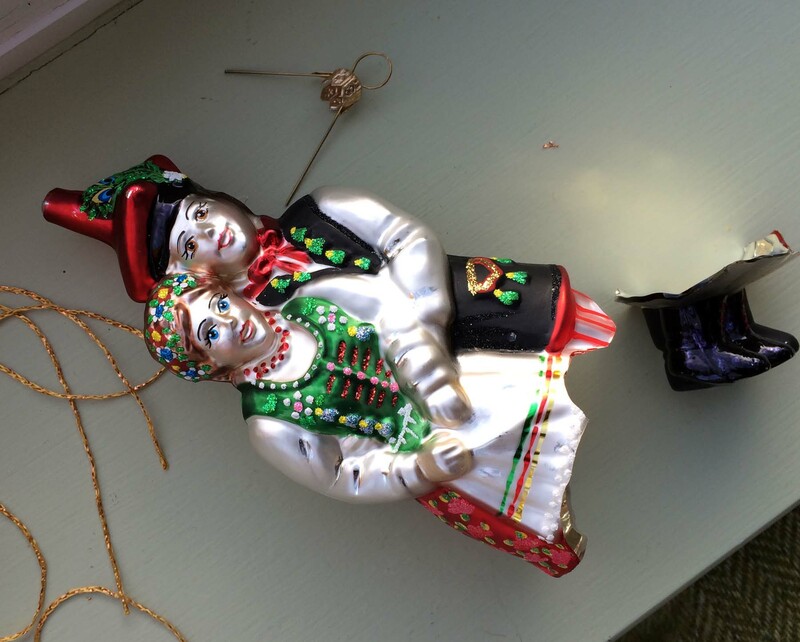 We bought this charming couple in Krakow a couple of years ago. There are new things to join the collection. 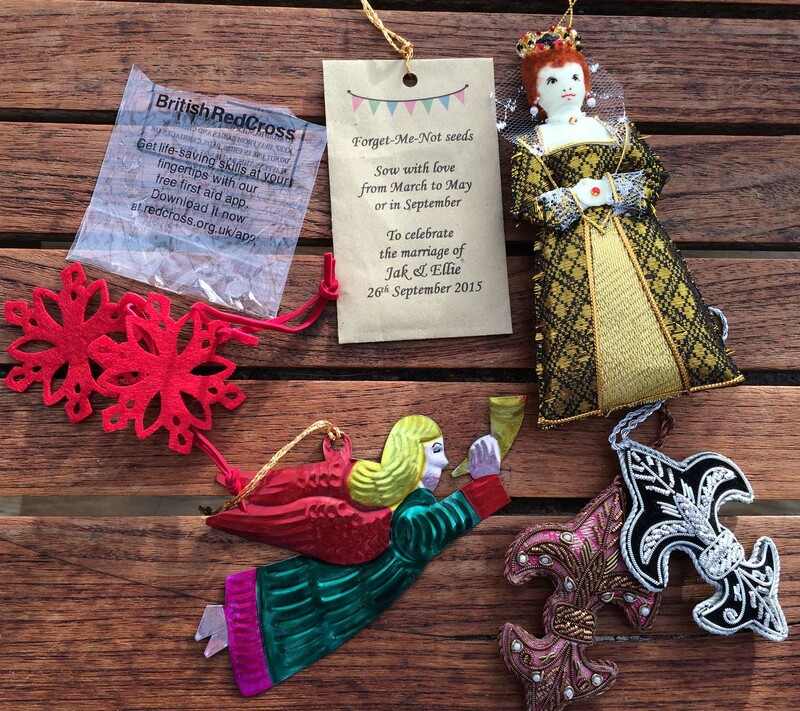 We already have Mary, Queen of Scots, so thought we should add Elizabeth I. Some delightful freebies from the British Red Cross, a Mexican angel – and a happy memento of Jak and Ellie’s wedding earlier this year. The pièce de rèsisistance for me is my knitting angel. 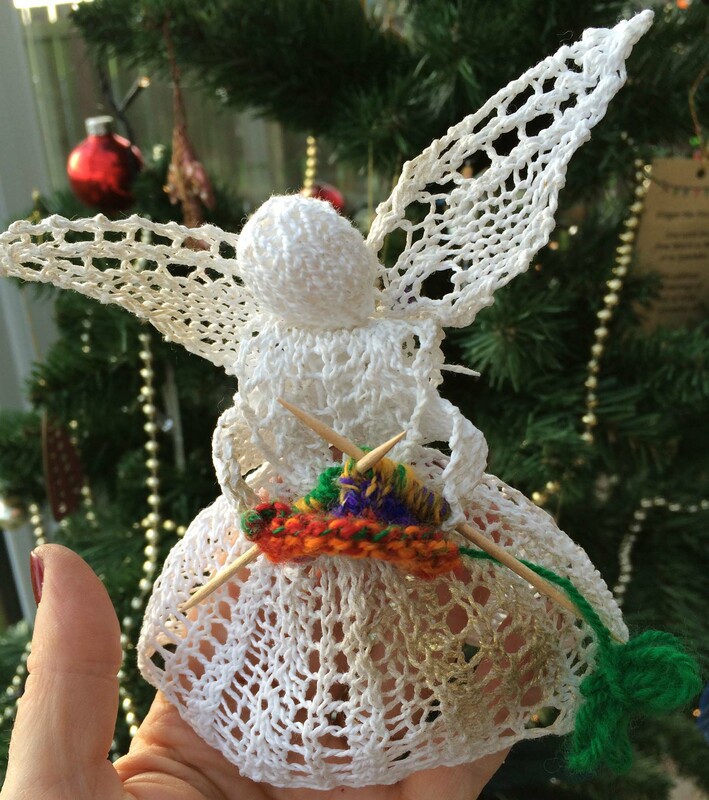 How could I not find a knitting angel enchanting – especially when she was made for me by the dear, dear friend who taught me to spin in Devon a good few years ago! 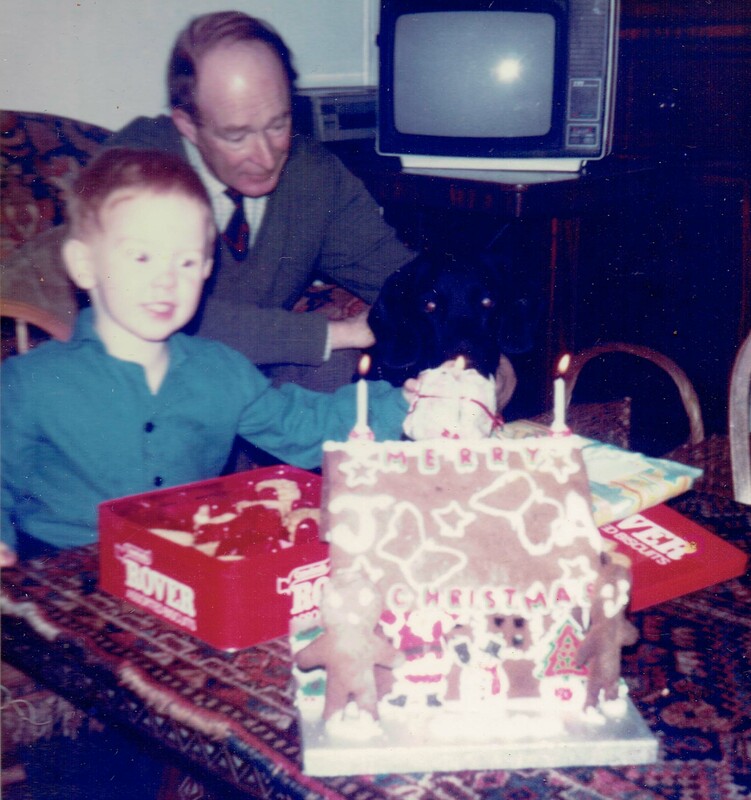 Christmas is often a time of looking back – memories are particularly poignant and powerful at this time of year. Over the last few months I’ve been scanning the family photograph albums, so I’ve been looking at Christmas through family recollections. These lovely pictures of my father with his parents in Melbourne are the oldest Christmas pictures I can find. 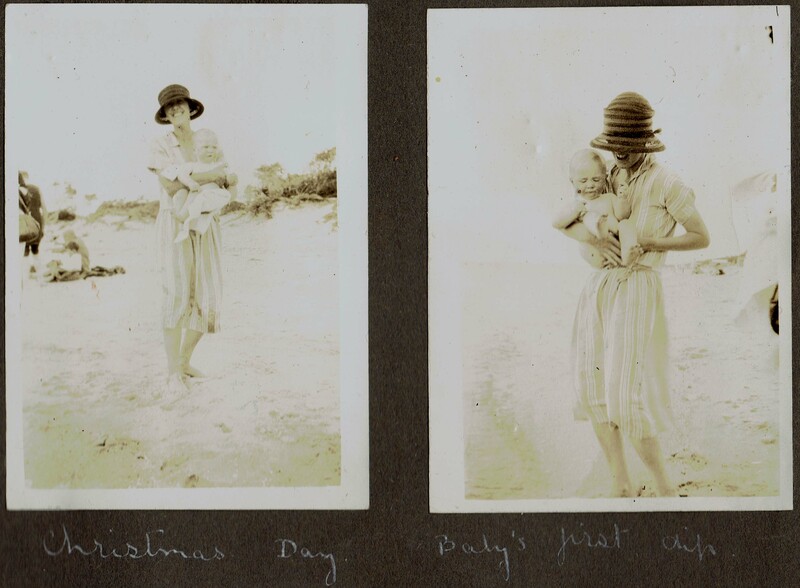 Here is my grandmother with her 9 month baby, Christmas 1926, taking him for his first dip on the beach at Cowes. She looks enchanting – so happy, so proud. 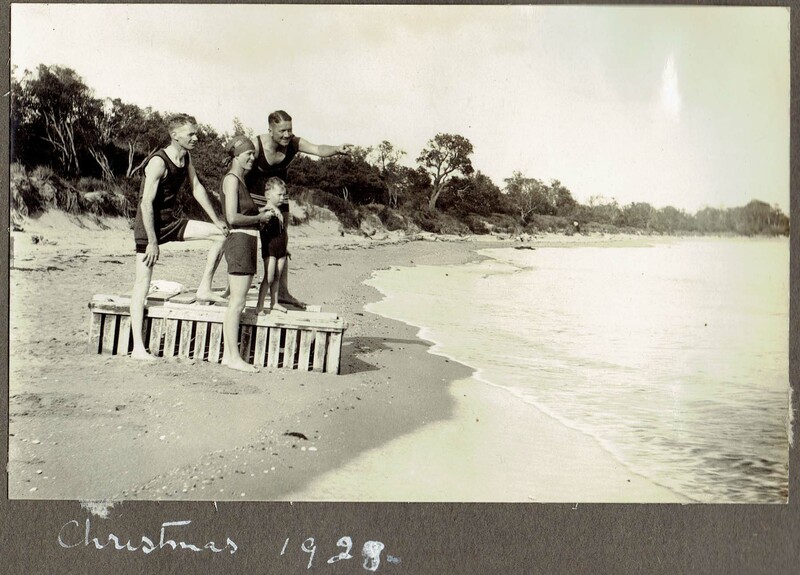 In 1928, they were again at the beach at Cowes. It’s my grandfather on the left, she’s in front, holding their little boy’s hand. They are clearly having such a happy time. I do wonder what they are looking at out to sea? My father’s holding his mother’s hand – for reassurance? He looks a bit worried – perhaps just that deep thinking of a child who is struggling to understand what the adults are telling him? Sadly, my grandfather, Vin, died in 1933. He had got amoebic dysentery in Gallipoli, and never fully recovered. Dora, my grandmother, later married an Englishman and moved to Leicester with her two little boys. So these are the only photos I have of the hot Australian Christmases that my father would have known as a child. 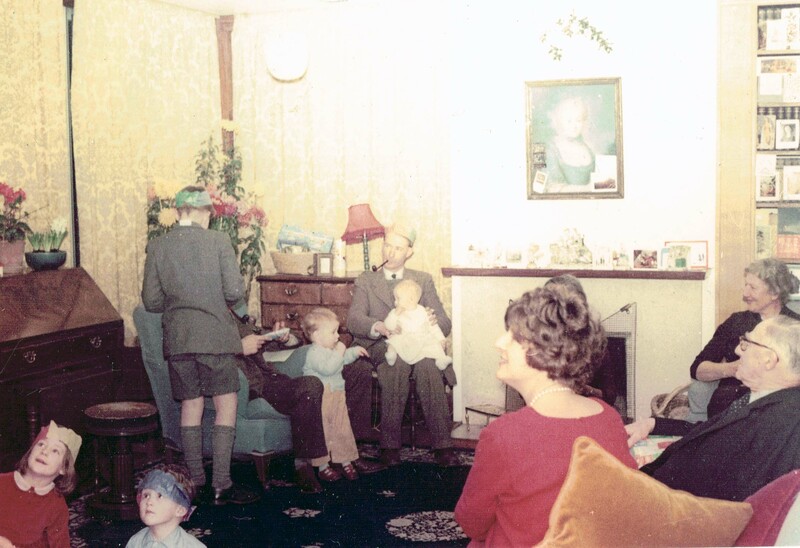 The rituals of big English Christmases that my mother’s family liked gradually took over. 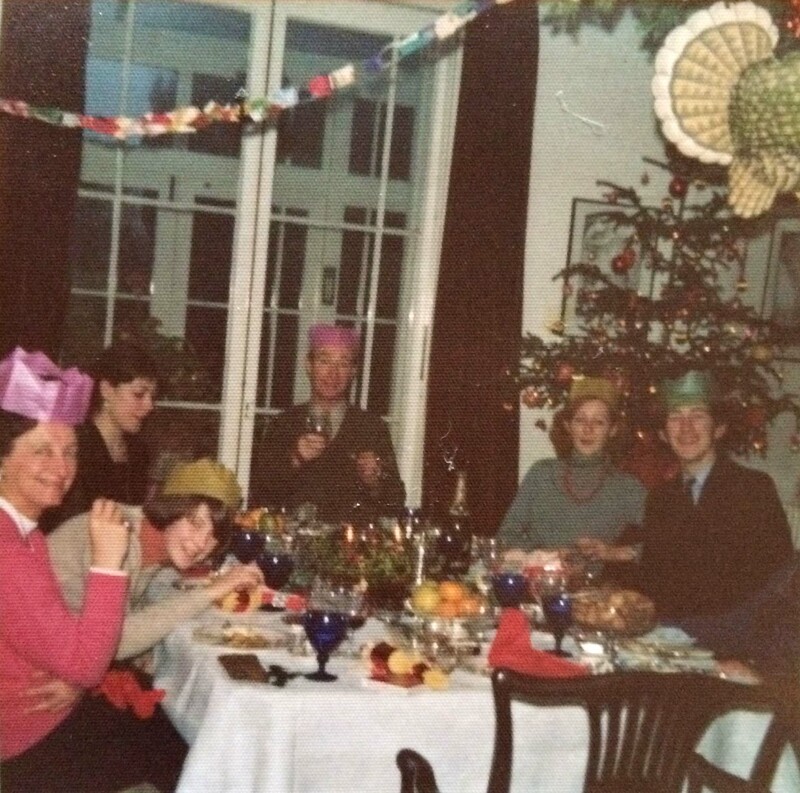 Here we all are at my grandparents’ table for Christmas Lunch, 1961. 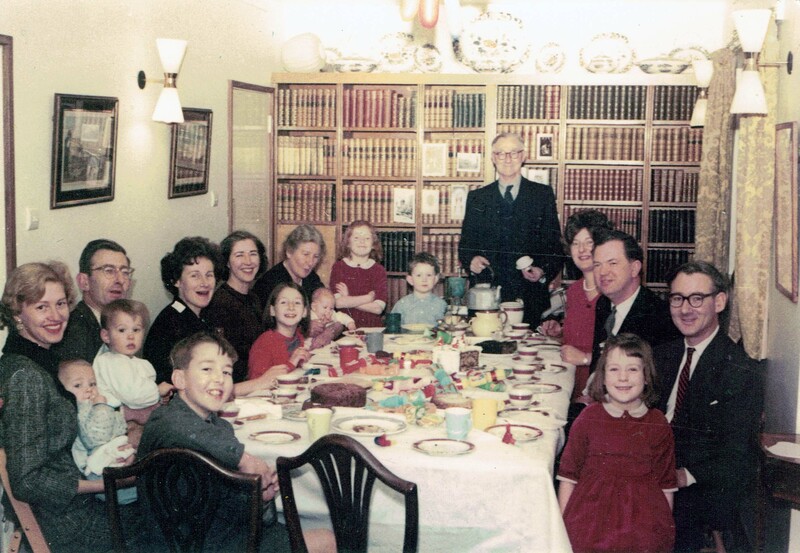 My parents are there with their four children (err – yes, that’s me the bossy one with her arms folded at the end of the table), together with all my other aunts and uncles. There are still a few grandchildren to come …. This photo records a rare family get-together. My father (the photographer here) and uncle were both British diplomats so spent much of their working lives abroad. My uncle Bow (on the far right) lived in California with his family. No wonder my grandfather looks so pleased – truly a grand-paterfamilias moment! Aaah – those reprehensible 1960s habits! Here is my father smoking a pipe – and, oh dear, holding the baby at the same time!! It’s really an archetypal Christmas picture of its era. The paper hats, the gathered family in their Christmas best, the well-behaved children, my cousin in his short trousers …. this could well have come straight out of a Ladybird book on Christmas. 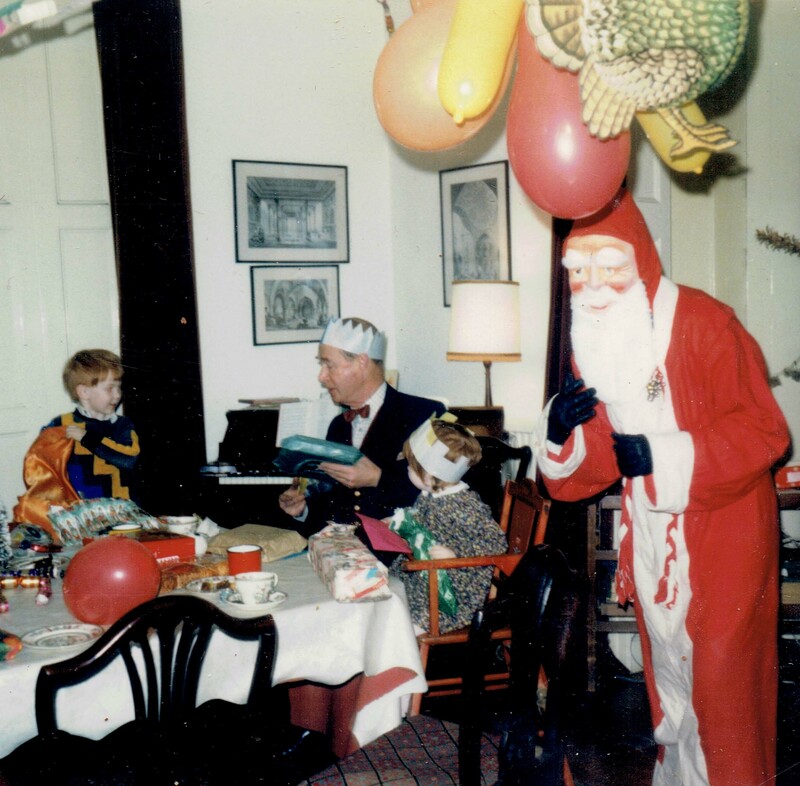 My mother’s family always got a visit from Father Christmas. 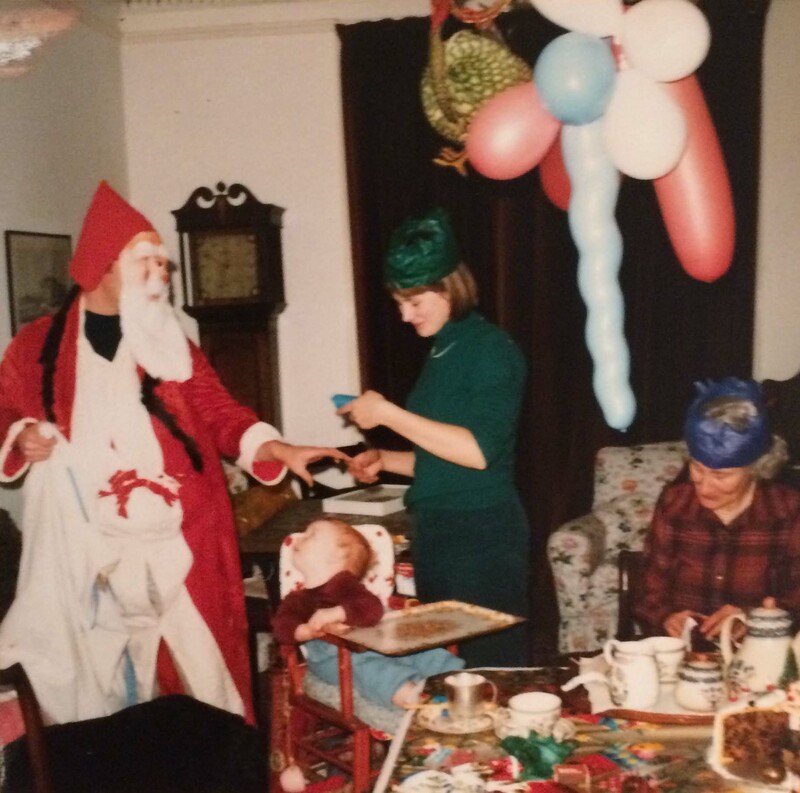 Here is my patient Uncle Harry wearing the family Father Christmas costume with great aplomb (my mother’s the helpful elf behind). A few year’s later, my father’s work took us back to Japan. He was Head of Chancery (sort of Embassy Personnel Officer) during this time, so he felt very much that is was his job to look after the waifs and strays at Christmas. This meant a formal Christmas lunch in the dining room, cooked (as usual) by our Japanese cook, Mori-san. We were waited on by our two lovely kimono-wearing Japanese servants, Hisatsuni-san and Mitsuko-san. There were always spinster secretaries and batchelor diplomats who joined us for lunch (during which we children obeyed the old adage to the letter of being seen and not heard). Afterwards, my father would get us all out to play football on the lawn. The fun was to see how poor Miss X from the secretarial pool coped with the garden mud in her unsuitable suit and heels. 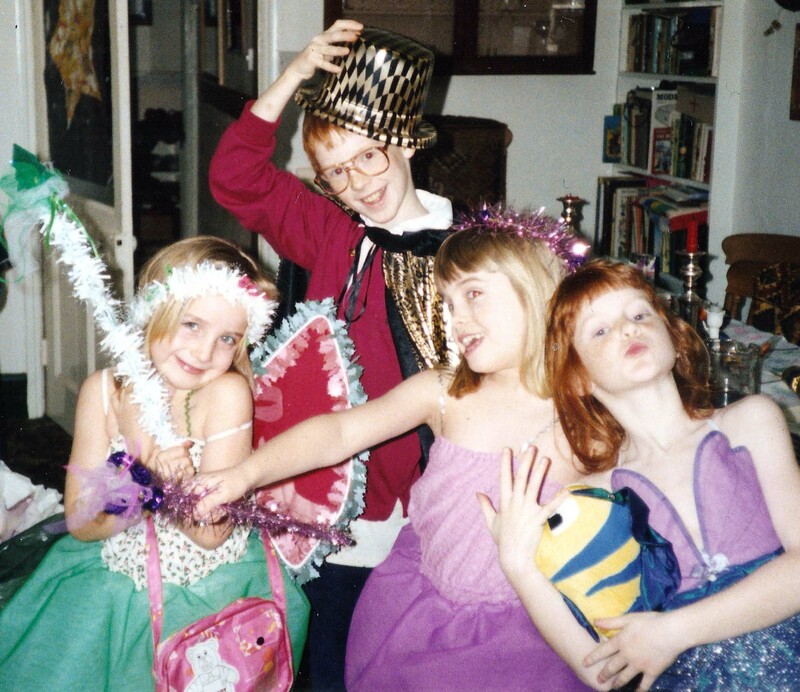 How I wish I could find photos of those Christmases! One Christmas – one awful, awful Christmas, – there was the disaster of the Chancery Guard’s lunch. All the Embassy staff enjoyed a Christmas holiday bar one person – the Chancery Guard. He had to be on duty in the Embassy offices in case an important telegram came in, some crisis in Whitehall etc. In his Head of Chancery role, my father promised that we would supply lunch for the Chancery Guard as the offices were just round the corner from our house. Alas, we forgot! It must have been about tea-time when we realised. My father turned black with anger and mortification – how could he forget and fail! A deputation of children was roped in to trail round to the Embassy offices with cigars, bottles of spirit, crackers, chocolates – and I guess some cold turkey. But my father never forgave himself – a pall of black hung over the day. Memories of the Day we forgot the Chancery Guard’s lunch remained with my family for a long, long time. Christmas 1966, and I was given a camera for Christmas – a very nice Japanese Minolta. These are some of my first photographs. 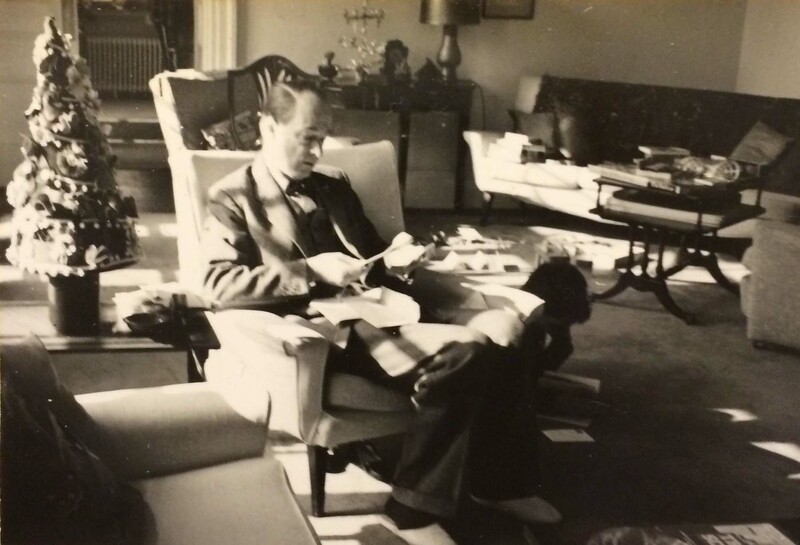 Here is my father, amid the detritus of Christmas paper and presents, in our huge Department of Works furnished sitting room. Diplomats entertained regularly and – in those days – were provided with large, elegant houses and regulation Government furniture. I also photographed my Christmas presents in my bedroom. 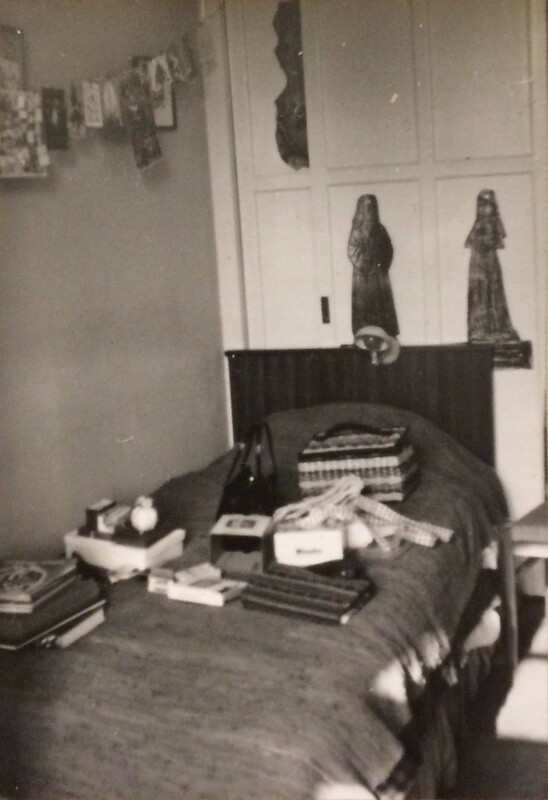 I was 12 – on the cusp of the teenage years, so I’d been given a smart black patent handbag (must have been my first “proper” handbag), and there’s a sewing basket I can see there, along with quite a few books. How arid and unexciting that would seem to today’s 12 year old! Actually, I was quite contented with my Christmas presents – but I did have a rather big paddy later on those holidays about the endless old-fashioned hand-me-down dresses I was expected to wear. My mother finally took me to one of the fantastic Japanese department stores and bought me a couple of Mary-Quant-style dresses so I felt better equipped for the parties of the season. There were lots of parties in the Embassy world over Christmas. I didn’t go to this one, of course. 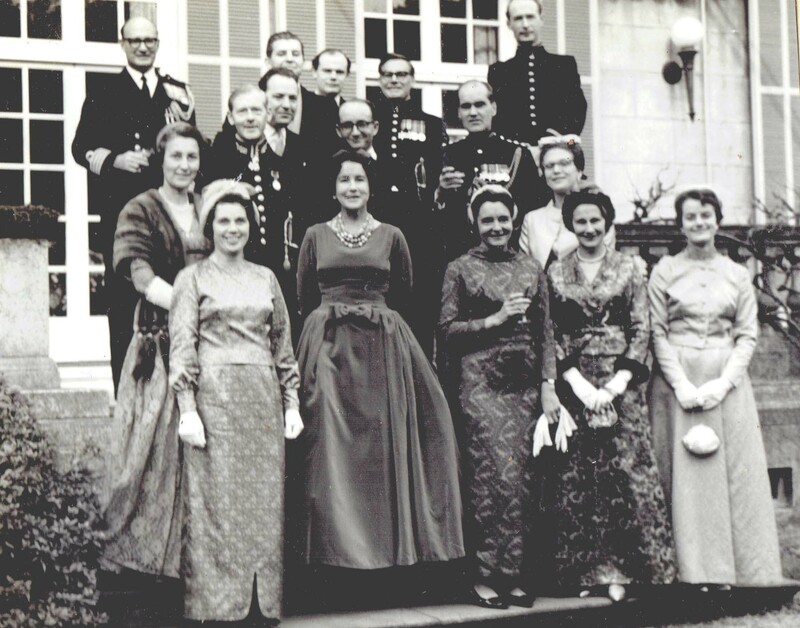 It’s the 1964 Imperial Court New Year party – that’s some dressing up! My father is standing at the top right, very smart in his diplomatic uniform, and my mother is second from the right at the bottom of the picture. She looks gorgeous. It was also during these holidays that my parents took us Christmas shopping to the Ginza shopping street – an incredible glittering Christmas experience. They bought each of their four children the Christmas ornament of our choice. 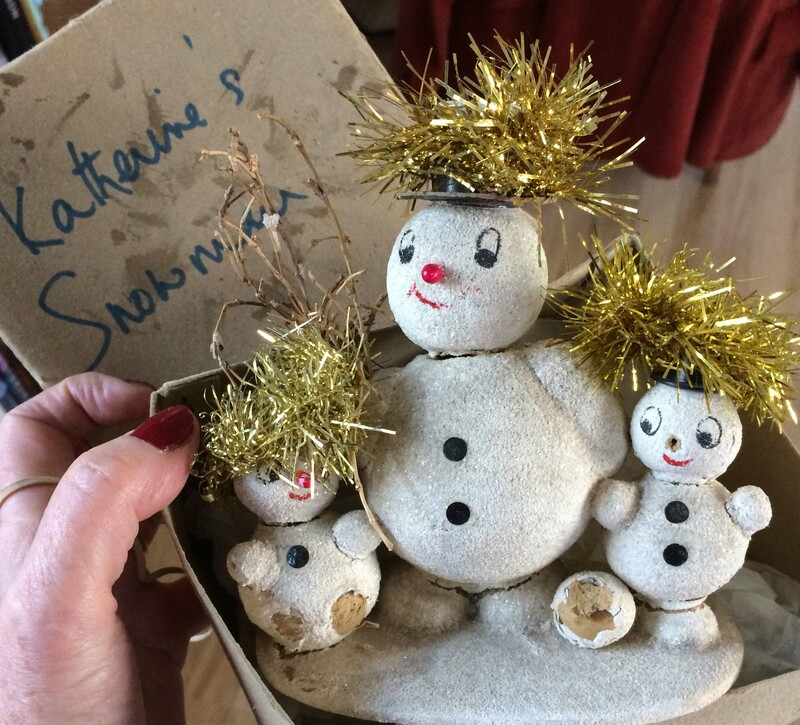 This snowfamily was my choice – a bit worse for wear now, but still very much treasured. 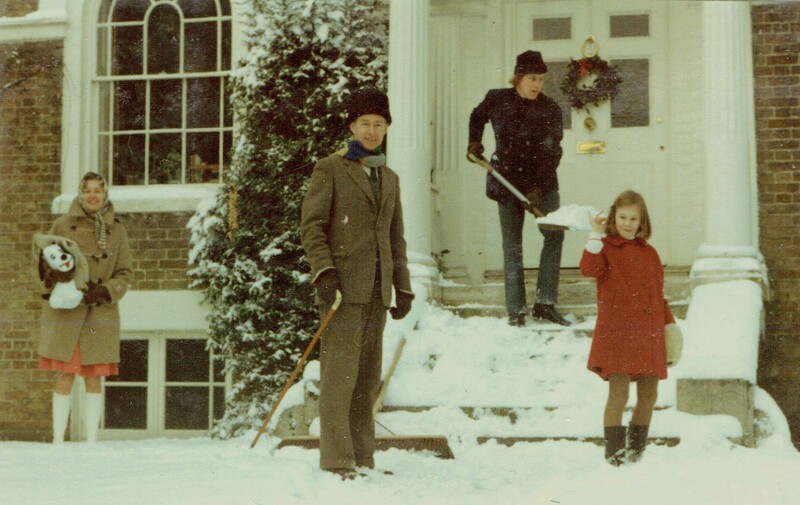 By the 1970s we were back in England, and, his Australian summer Christmases long forgotten, my father settled into comfortable paterfamilias mode. There’s even a spinster secretary (on the far left) who has joined our family Christmas dinner. There were no Japanese servants working for our comfort any longer. 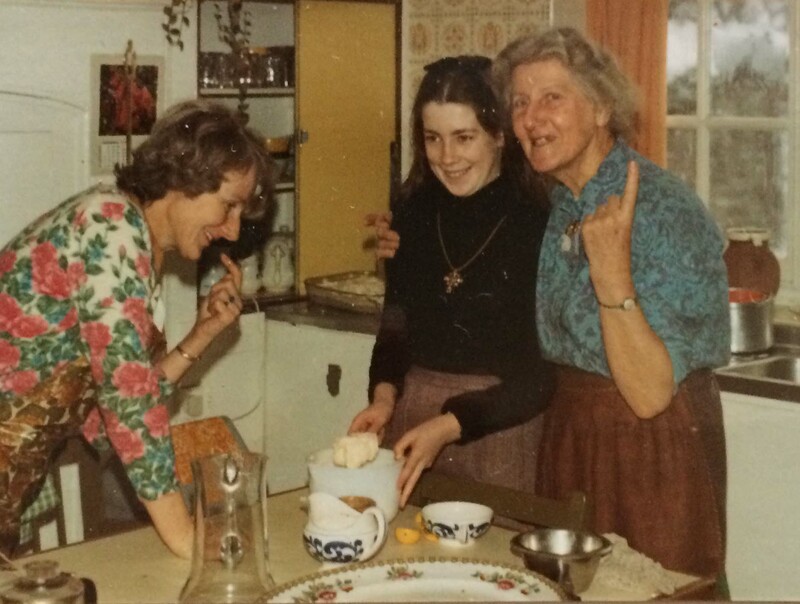 Here the kitchen is staffed by family: three generations (my mother, grandmother and sister) making brandy butter together. 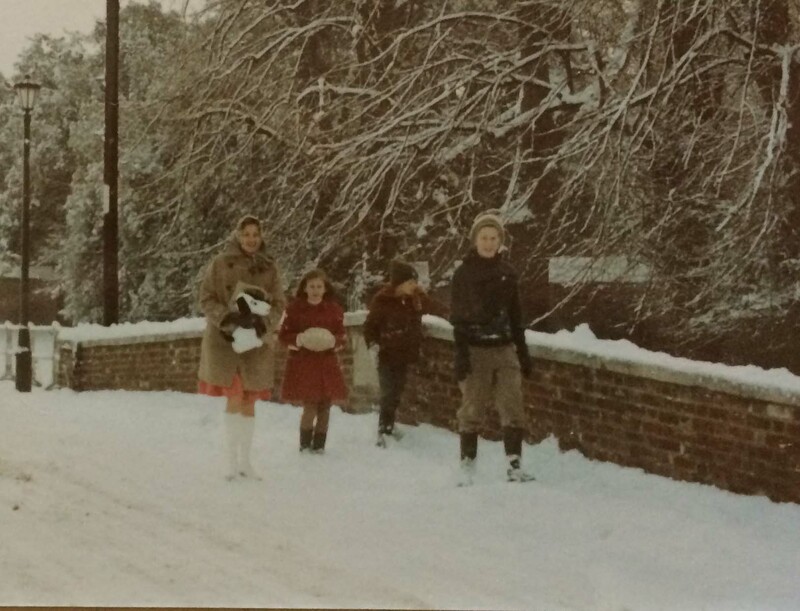 One year (1970) we had proper snow. How opportune! That’s one of my Australian cousins clearing the steps (as though he had done it all his life) and my Californian aunt is standing on the left of the picture. A really proper picture postcard English Christmas laid on just for them. We walked to the church through the charming snowy English village. 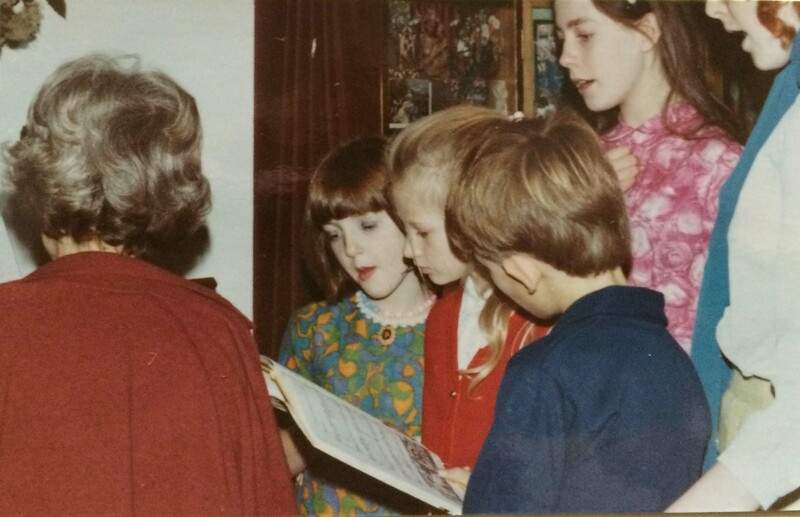 And we sang carols around the piano over the holiday (my mother playing). It could almost be out of the same Ladybird Christmas book that I mentioned earlier. Just when you think you’ve got this Christmas thing sorted, along comes a complication. Yes, it’s a delightful complication – but not at all what I expected. I had a Christmas baby! 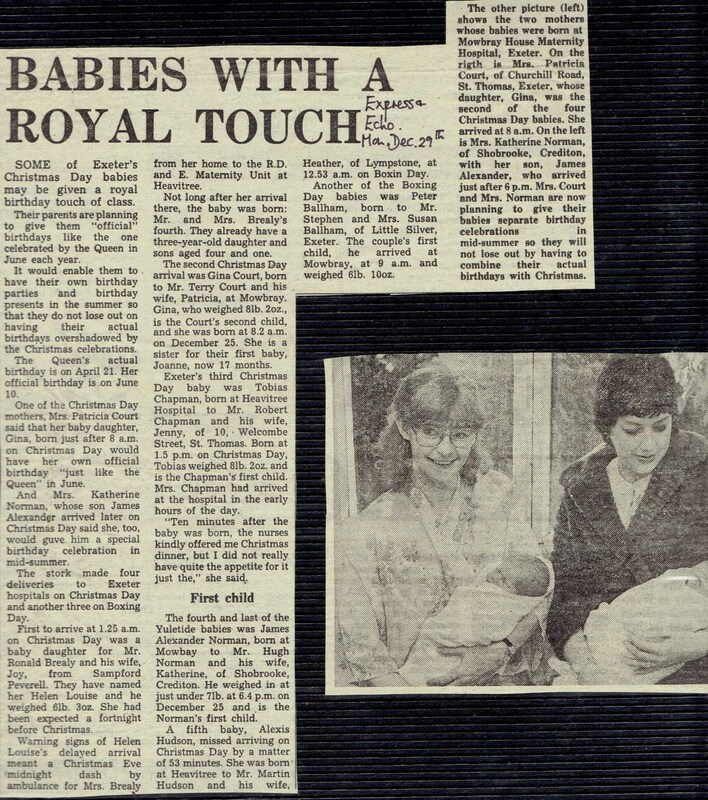 I still have the letter in which my mother wrote to me in the days before James was born, telling me that I must make sure not to give birth too close to Christmas – it just wasn’t kind! (He was 10 days early.) A Christmas birthday puts a whole new complexity on the celebration of Christmas. There were yet more presents for James (at tea-time), – and there were special cakes. I worked so hard to make this gingerbread cake! 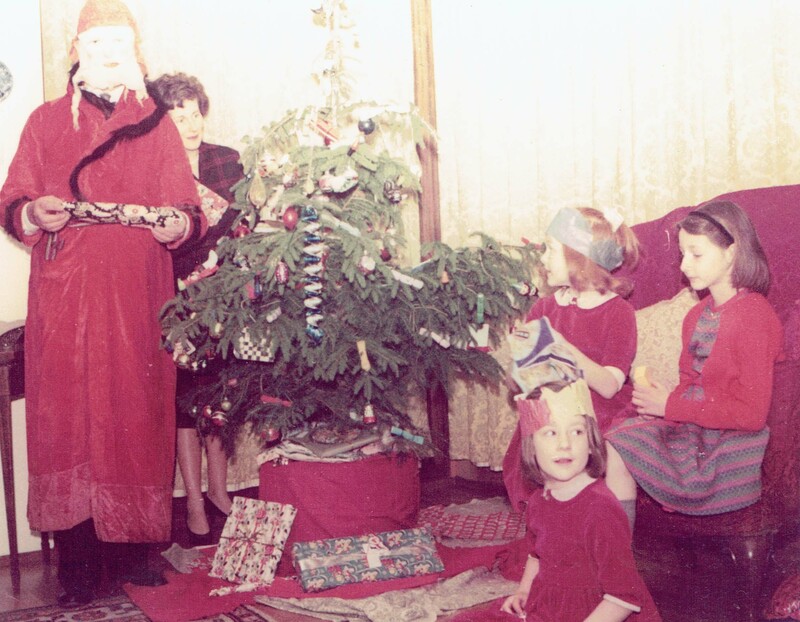 In 1981 Father Christmas started visiting us. James is definitely very intrigued – does he know something about the person wearing the costume that we don’t? He visited again in 1985. I think it may be my brother wearing the Father Christmas robes. By now the children seem to be taking Father Christmas rather more for granted. 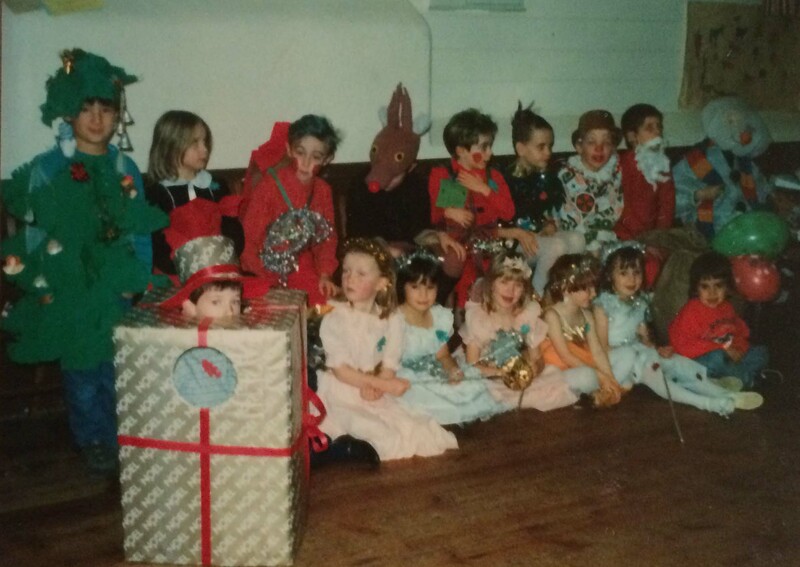 A Christmas birthday was, of course, a great excuse for a children’s fancy dress Christmas party. Here we are in a rather cold and draughty Devon village hall. It’s 1988. Judging by the costumes, I think I must have asked the girls to come as Christmas fairies and the boys as Christmas decorations. Skip through the years quickly, and I’ve been through a divorce and embarked on a new marriage. I have four step-daughters – we are a step-family! Perhaps the hallmark of stepfamilies should be flexibility. We certainly were open to change. One year’s Christmas lunch was Shepherds’ Pie, Star-gazy Pie and Angel Delight. Hmm … an experiment never repeated. Of course, what really changed in recent years is the abundance of photos – digital cameras make a big difference. For the new step-family, there were ups and downs, comings and goings, swings and roundabouts. Lots of happy Christmases in amidst all the changes, perhaps summed up with this lovely picture of four of our children in the fancy dress costumes that I had made them for Christmas. Just as Christmas is a time of looking back, so it is a time of looking forward. Dawn is a metaphor for hope, for blessings, for future promise of goodness. 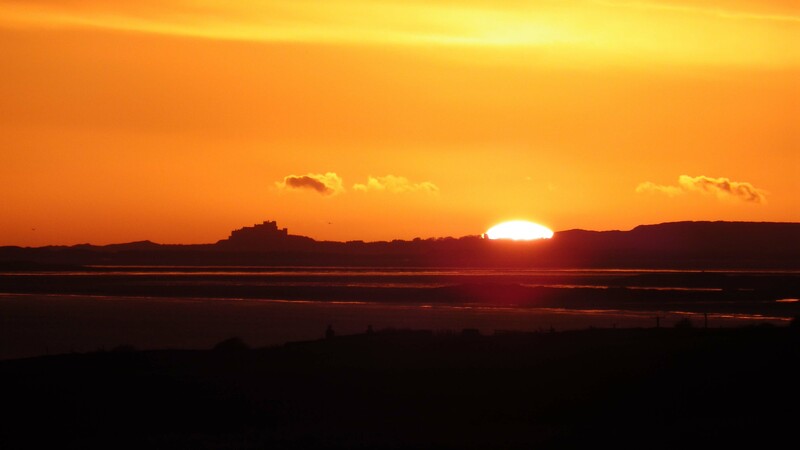 So I leave you with this magnificent picture Stephen took of the sunrise this December solstice morning. Happy Christmas to you all!